I've been wanting to talk about the relationship between luck and skill for a very long time now. As it turns there is a very thin line between the two - and the relationship is probably completely different to what you'd expect. A few weeks ago I've had long conversations with Jamie Ford about success (particularly from the sales point of view) - what defines it and what accounts for it. Jamie Ford is a business owner and professor who also happened to write a post for Business Blogs at the time I met him. He argues that optimism plays a large part. This is infact a very true point. of a fortunate event. Luck will hardly ever come out of nowhere, instead something must happen beforehand and that something is the potential which must be noticed and acted upon. Wiseman describes experiments set on people which show that the ones that consider themsleves lucky have it come their way rather often. These are the people who have the right mindset and tend to notice some aspects (which later lead them to getting 'lucky') more easily than the people that consider themselves unlucky. These aspects are what we call opportunities. In other words the ones that have all the luck stay more open. They possess the precise mindstate to recognize and seize an opportunity as soon as it arrives. Luck however is also heavily reliant on skill and for that matter effort as well. I always think that luck is more of a reward which comes as a result of hard work. As I briefly mentioned in The Plan I'd like to bring up my point of view strictly from my own experiences. I am currently a university student studying design. I work part-time for an advertising agency as a graphic designer. When I talk about my job I often get told that I'm lucky. At first I used to dispute that but lately the more I think about luck the more I realize how plausible that statement may really be. The fundamental reason for my assumptions go back to how I found the job in the first place. But before I go into that and to really get the point across I must go back to about 4-5 months even prior to the job hunting. I was in the first year of my course back then and it all started with a client from Canada through oDesk (more about this here). What begun as a small illustration project turned very time and effort consuming due that very client. Specs would change in a blink of an eye and I had to start over a nearly finished design on two occasions. As the process went on, the deadline was getting closer and as a result I ended up working 18 hours straight. This happened twice. I've never pulled anything like that before and regardless, I still missed that deadline by 4 days. Two things resulted from this. A stunned client when he saw the amount of work I put into the illustrations in such a short period of time (I'll be putting these up on the portfolio once I finish updating the LoveColour Homepage in about 2-4 weeks time) and a very high rating from oDesk. 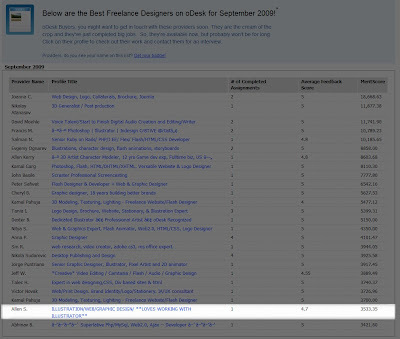 So high infact that it scored me a 24th place amongst 40,000 others on the Best Designers of the Month list. This was the catalyst. It led me to applying to local jobs. I just so happened to be in the right time at the right place when I applied for my current position. They called me in on the next day and I talked as much as I could about my previous experience and my capabilities. The trick is being confident. It's always about confidence. The oDesk rating was what gave me mine. Of course I mentioned it whenever I could but the real significance in this is that it all happened right at the time my workplace really needed someone. This is where the idea of luck came in. Perfect timing. This whole experience was my reward. Luck however can only take you this far. While it played a significant role in receiving the opportunity, the rest of it was all up to me. I was originally needed only for 30 days; I've been working there for almost 5 months now. Success is heavily reliant on the amount of resources you have at your disposal and in most cases those can be earned with the amount work you put in. And I think this is the real key here. The more effort you put in the more opportunities you receive. Luck is more like a follow-up. In reality luck IS a skill - have a look at this article written by Richard Wiseman, the one about setting experiments on people to test how lucky they are.